On April 3, 2019, the American Planning Association Announced the 2019 National Planning Award Recipients. 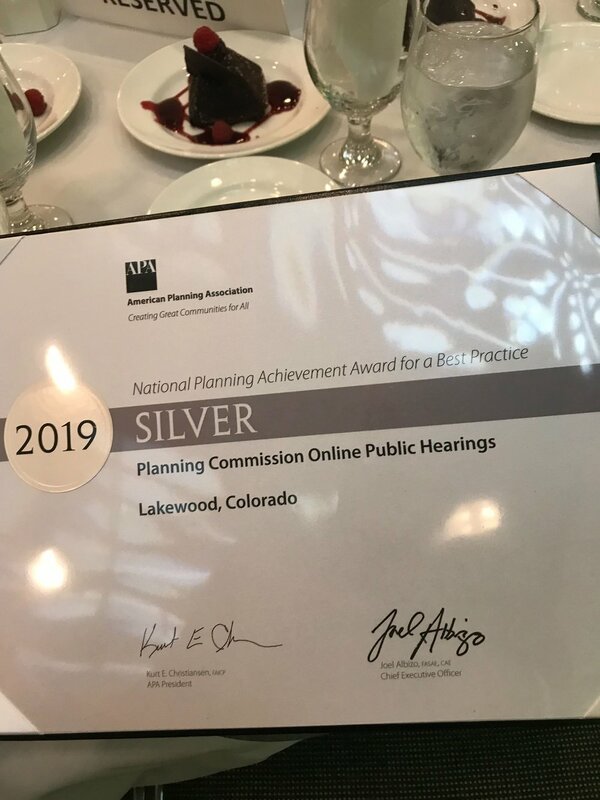 Lakewood, Colorado won a National Planning Achievement Award for a Best Practice! The web-based platform, LakewoodSpeaks.org, enables citizens to participate in Lakewood Planning Commission hearings two weeks before the live meeting. Citizens can review presentations and documents, ask questions of staff and project applicants, and comment on proposed actions, all on their own time and at their own pace with the same level of experience and impact as attending the live meetings. Public participation in planning meetings has increased significantly since LakewoodSpeaks.org launched in August 2017. Interested in learning more about the platform powering LakewoodSpeaks.org? Check out the webinar “The Next Evolution of Public Hearings” hosted by the American Planning Association on Friday, March 22, 2019, which drew an attendance of nearly 600 participants! In this one and a half hour long webinar we share the case study of People Speak's online public hearing software and its impact on the City of Lakewood, Colorado. Talking with clients and others in government we’ve discovered a lot of confusion about the distinction between the different types of citizen engagement tools. With an ever increasing demand for transparency and new forms of citizen outreach, cities are looking at many ways to engage and inform their residents and there are many tools that can help. If you are in the process of seeking a technology solution, it’s valuable to understand the differences in what these tools can do. Probably the best known are the online town hall civic engagement ones. Bang the Table, Citizen Lab, Idea Scale, MetroQuest and many others fill a crowded market for collecting quality input from citizens on large projects. These tools are great for engaging people for a new comprehensive plan or a large infrastructure project. They are staff intensive and useful for big projects but impractical for the everyday workload. Tools like CivicPlus and MySidewalk offer governments the opportunity for an online 311 service. These tools allow the public to ask general questions and report issues. This is a very useful service for governments to provide, but is not meant to allow for review and comment on current projects or Council actions. There is a huge market for moving the permitting application process online. Dozens of companies like OpenCounter, Citizenserve, and MyGovernmentOnline automate the business of the permit counter, putting both application and process information online. This is a growing business as more and more governments realize the need for automated permit services, but as with the other tools this is separate and distinct from citizen engagement and online hearings. People Speak started because none of the existing tools allowed cities to conduct the business of public hearings online. Public hearings are traditionally and continue to be in-person events; very few governments have begun to use technology to change participation in public hearings. People Speak is solely focused on helping public hearings evolve to meet the demands of the future generations (read our manifesto here). Missed us at the APA Colorado State Conference or want an update on how things have been going? Join us at an upcoming webinar, “The Next Evolution of Public Hearings” hosted by the American Planning Association. The webinar will feature a case study about the City of Lakewood, Colorado, and how they’ve innovated their public hearings by adding an online component. The process and format of public hearings hasn’t changed much in the past century. As technology continues to improve and lives get ever busier, a shift toward more online input in public hearings is inevitable. Learn what Lakewood has done to evolve its meetings to allow for online participation and how their experiences might help your community. Introduction: Mr. Parker will present and discuss problems with current public hearing format including participation gaps, information flow problems, and logistical limitations. Mr. Parker and Mr. Sperling will describe the online platform created by Lakewood and People Speak to include online participation in public hearings. They will review factors that were considered in design of the site. They will present the site and its functionality. Mr. Rice will describe the rollout and results to date in Lakewood including examples from cases and overall impacts on the process. City of Lakewood, Colorado - City Council launches! In August of 2017, we proudly announced the beta launch of our public hearing software platform with the Planning Commission at the City of Lakewood, Colorado. The success of the software has been exciting (check out these pilot test results we presented at the APA Colorado State Conference in Telluride, Colorado) and today we’re thrilled to share that City of Lakewood City Council has started to use the platform! Adding the City Council’s public hearings to LakewoodSpeaks.org was made possible in part by the addition of a number of features that increased the flexibility of the People Speak platform (such as advanced settings, support for multi-body functionality, among many others) that we added in the fall. Join us at an upcoming webinar hosted by the American Planning Association (learn more and register here) where we’ll be sharing a case study of everything we’ve learned and done with the City of Lakewood. Over the last few months we’ve been quiet and heads-down building new features driven by customer feedback. You talked, we listened! Managing decision-makers takes a lot of communication: letting them know when to review comments, sending them the public hearing agenda, reminding them of any unread comments the day of the hearing, etc. Now that whole process is automated, eliminating staff work while increasing the utility of the communication by including stats and deep links to specific places on the site. When should the comment period close? When should reminder notices to be sent? Who should receive comment moderation notices? Those and more can now be easily managed by staff admins. To make it easier to track down which decision-makers have unread comments, we now display this in the admin for staff to get a quick snapshot of the status. This release introduces the first module of our advanced page editor, which allows staff to add as many PDF files to a page as they need. Drag and drop controls make it fast to change the order and make the page support the necessary content and flow for each case. What happens if one of your staff is out sick or on a holiday and citizens have submitted questions that have yet to be responded to? We’ve added a new section in the admin for each case where any staff can see the messages sent through the site, whether to staff or applicants from citizens. Messages are grouped by email threads of related messages comprised of replies of the original email. By far the most expansive update is support for multiple bodies. For example, sites can now support cases from both a Planning Commission and City Council on the site. Filters allow citizens to select the cases relevant to them. Under the hood, staff for each body are able to login and manage cases just for their body but all via the same admin site. Agendas are also separated by body, so decision-makers only see the cases for the public hearing to which they are a part. We’re excited to see the impact of these new features in the coming months! "Public involvement in government decision-making is notoriously spotty and unrepresentative of communities affected by decisions. A suburban city in Colorado is trying something different, with measurable success, which could become the new norm for what might better be called public engagement." On the role People Speak technology played in changing the public hearing process in Lakewood. "Lakewood Planning Director Travis Parker believes the city's new online participation tool is boosting participation and transparency. LAKEWOOD, CO – As more Lakewood residents are becoming concerned with development in the city, Lakewood's Planning Director, Travis Parker, and the staff of the planning department have introduced a new way for residents to participate in public meetings. The city's new public portal Lakewoodspeaks.org has been running for eight months, and Parker writes that it has been a success so far." How does using People Speak software for your public hearings impact representation? The Planning Commission at the City of Lakewood looked at the age of participants and the time of day of participation for a few recent cases to find out. Details in the article Public Engagement: The Future In 2 Data Points on StrongTowns.org.